This is a throwback Thursday re-post of a baby quilt tutorial that I did for Shannon Fabrics back in 2013. I’ve been around long enough and I have so many new followers, that it’s nice to reintroduce you to some of my previous work. Plus, I’ve got some great tips for working with Minky, and you’ll want to see how I used the Minky backing to bind my quilt! I love using Cuddle fabric (also known as Minky) from Shannon when I make quilts. Not only is it ultra soft, but it comes in so many delicious colors and textures. 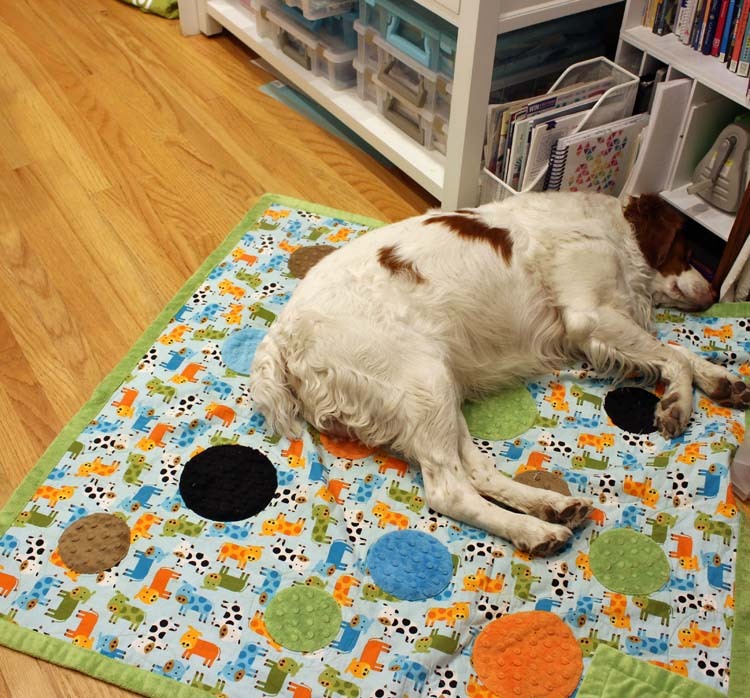 It can turn an ordinary quilt into a comfort superstar. Knowing the nature of the fabric plus a few tips and tricks will make it fun and easy to work with. Cut the Urban Zoologie fabric into a 42″ inch square. 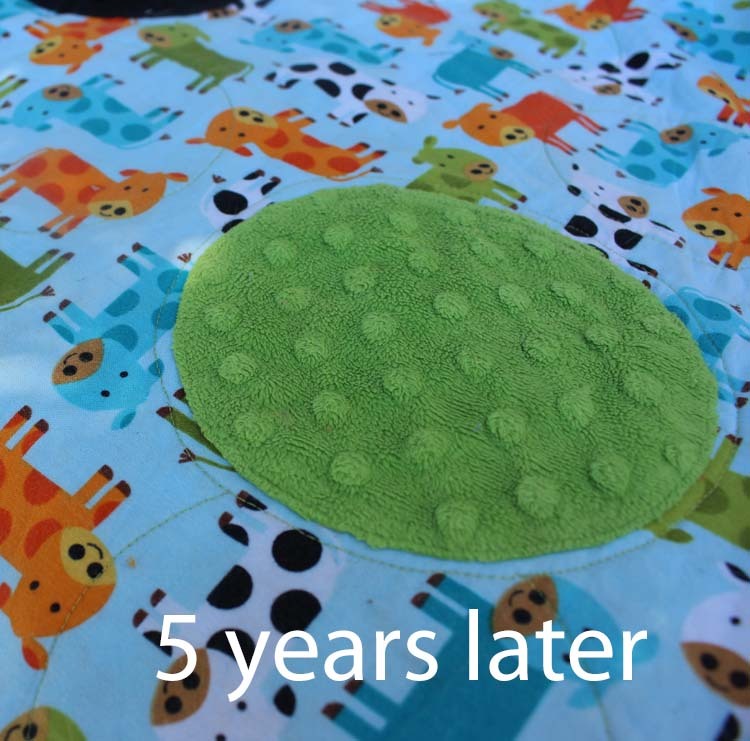 A few notes about appliqueing with Cuddle fabric: Cuddle fabric has a nap to it and it can be easily crushed when pressed with a hot iron (especially the Cuddle Dimple used in this project). Because of this, I don’t like to use fusible web products when working with Cuddle. I simply cut out the shapes and baste them in place with a water soluble glue – such as Roxanne’s Glue Baste It. Cuddle does not fray once it’s cut other than the “cuddle dust” that is released after cutting. You can stitch the applique shapes in place with a straight stitch or other decorative stitch of your choice (more about that later). 1. Make circle templates from freezer paper using bowls of three different sizes. Using a fine-tip Sharpie, trace around each bowl onto the dull side of paper. Press another piece of freezer paper on top so that both pieces are shiny side down. This will create a sturdier edge for tracing around later. 2. Carefully cut out freezer paper circle on drawn line. 3. Trace circles onto the wrong side of dimple fabric using marking tool of your choice. I found it easiest to use a fine-tip Sharpie for most of mine – just make sure to cut inside the drawn line. Cut circles carefully as this will be your finished circle shape. 4. Arrange circles randomly on quilt top square. (Optional: Cute puppy helper)! Once you’re happy with the arrangement, baste circles in place: Using basting glue, “draw” a line of glue about 1/4″ in from the raw edge of the circle. Allow glue to dry (about 1 hour). 5. With matching thread, stitch around the edge of circles 1/8″ in from the raw edge using a straight stitch. Secure stitches at the beginning and end. Repeat for all circles. Note added for 2018: My applique shapes still look great after a dozen washings! Draw quilting guidelines using the circle templates and a blue water soluble pen (or other marking tool). I randomly drew circles between and overlapping the applique shapes. Quilt on the marked lines using a walking foot or free motion quilting. I love the way the quilting shows up on the back of this quilt! This quilt went together really fast. The applique is very simple and I think it would look great using other shapes and colors too. Maybe an “eye spy” quilt – Can you find the orange star? Any way you make it, I’m sure you’ll enjoy your Cuddly baby quilt! The current “owner” of this quilt is our biggest baby, Cooper. He loves to take naps in my sewing room and this is his spot. We take it on trips, too, to make him feel comfortable. He is a bit spoiled, right? Cuddle fabric is made out of polyester and it has some “stretch” to it. Cuddle fabric will shed (“cuddle dust”) and this is normal when cutting the material. You might want to shake it outside, or toss it in a dryer on cool for a few minutes. Use a 1/2″ seam allowance when stitching or piecing. Use a Universal (ballpoint) needle to sew with. Use lots of pins to keep edges together and to match seams. Use a walking foot when stitching. Increase your stitch length to 3.0 – 3.5 when quilting. Have you worked with plush fabrics before? It’s not bad once you get acquainted with it. I appreciate you walking down memory lane with me. We are going to Austin later today to visit our granddaughters (and our daughter). Amelia just turned 3 and Clara is 4 months old – can you believe it? I’ll be back with photos and more busy book information. Have a great weekend! Super cute Cuddle Quilt and Thank You for the excellent tutorial and tips. 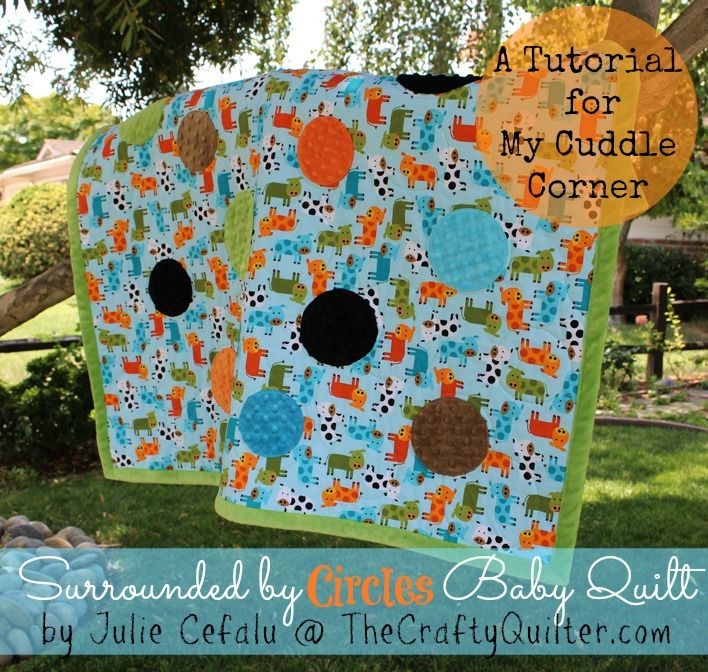 Hello Julie; This is an adorable quilt and wow you have once again written a magnificent tutorial! I have made sure to bookmark this post and save it to one of my Pinterest boards. Showing the variety of stitches you used on the fabric applique circle was a splendid idea and helps the individual really see what you are discussing and why you are doing it this way. Thank you again for a marvelous tutorial and pattern. Have a fantastic day! Have a lovely time with family and thank you for the great tutorial. Thanks so much for addressing the ‘cons’ for using adhesive spray for basting quilts. I also really appreciate your warning about overspray and your recommendation for a product to use for cleaning that up. When I use basting spray, it’s usually outside and on a covered surface (like my patio table). Oh, and I also wear an old shirt to protect my clothing from back spray. I LOVE your blog. I’m always happy when I see it in my email. You always have so many bright and refreshing ideas and so many excellent instructional projects. Love seeing your dog and seeing your kitchen project, and family goings on. You seem like it would be easy for others to be your BFF! With your lovely quilt expertise, it would be over the top. If you lived near me (Minnesota), I would surely go to a class of yours. Thank you Julie for re-posting this as i have always been interesting in Minky and it was always intimidating to me. I am happy to have your tutorials to refer back to. I also saw some of your tutorials the other day! Thanks for all the educational tips. LOVE LOVE LOVE This!!! Thank-you SO much! Finally! I have been so disappointed with ALL these “easy” baby blanket tutorials, and none of them ever quilt it, so I am always so puzzled about how the two sides do not seperate and cause issues!?!?!! I super duper was in need of this, THANK-YOU. I now have confidence going forward! Lovely ideas. Thank you, Julie.